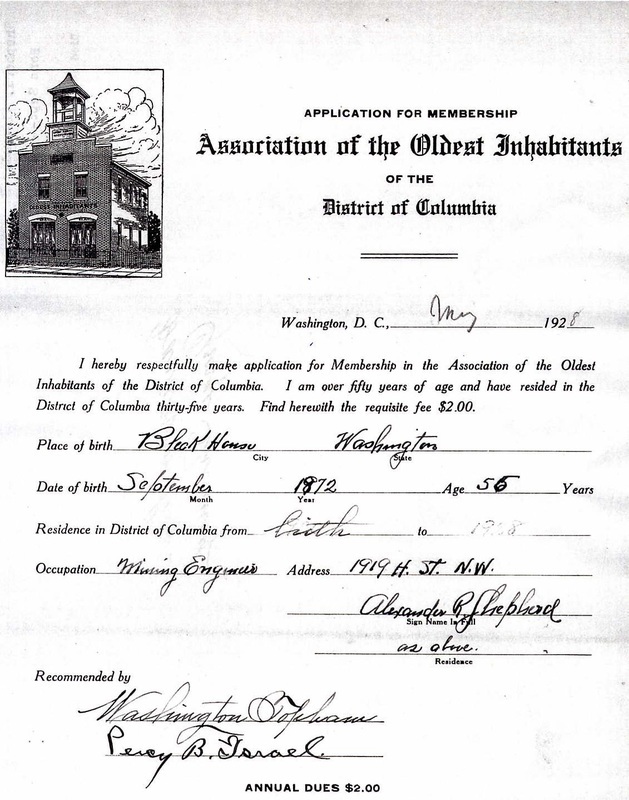 Your Ancestors in the AOI - The Association of the Oldest Inhabitants of D.C. Were Your Ancestors AOI Members? Your ancestors may have been AOI members. Want to find out? This may save you a trip to the Kiplinger Library of the Historical Society of Washington, DC or save a phone call to their research librarians. In September 2008, the AOI Board of Directors approved, in concept, the Sesquicentennial Project. As envisioned, this initiative would index all names found in the AOI Archives housed in the Kiplinger Library of the Historical Society of Washington, DC (Finding Aid MS422) to be completed by the AOI’s Sesquicentennial, December 7, 2015. The goal of this project is to provide a means to identify the location of past AOI members’ references in the more than 50 linear feet of the association’s archives. This should provide assistance to researchers and AOI member’s descendents searching for biographical and genealogical information about past AOI members. 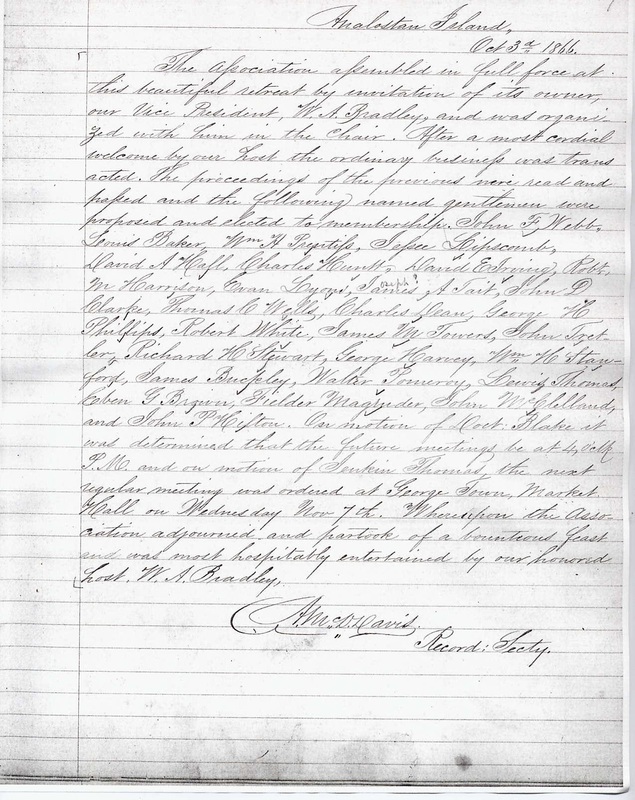 In order to help determine the ‘usefulness’ of this information, users should keep in mind the following: Membership Applications, particularly between 1890 and 1916 offer the most biographical information as, it appears, the organization was more interested in a member’s ‘lineage’ than at other times. Biographies are the richest in detail and usually have been compiled by the member themselves or by another researcher. These two categories of records provide the greatest amount of information. As of July 14, 2009, only membership applications through 1973 are included. More recent records have not been indexed but may be found in the "Financial Issues" folders in Container 18 and greater. Membership Rosters, Pamphlets, and Minutes often only provide a passing reference to the name. Articles may or may not provide in depth information as the subject of the search may not be the subject of the article. Obituaries, photo copied from the Washington Post, Evening Star and other papers, may provide insight into ancestor’s accomplishments, but often is already part of a family’s records. Membership Certificates often provide only the member’s name and date they joined the AOI. Photos may be of the individual or a group photo. When using the HSW Finding Aid and the AOI Name Index, please report any errors, corrections or comments to the AOI at aoiofdc@gmail.com. Use the ‘FIND’ feature of Adobe Acrobat Reader, type in the name of the target person and use the accompanying information to determine the ‘type’ of information on file and whether the name in that type of document may be helpful to your inquiry. The search results identify the Container Number, File Folder Number and ‘Type’ of information on file with an additional ‘Comment’ when appropriate. The member’s Date of Birth, Place of Birth, Date of Death and Date Joined are provided if available. If the member’s Title or position in the organization is not readily apparent (President, Vice-president, Recording Secretary, etc. ), it is assumed they are simply a Member. To view a recent version of AOI's Finding Aid in the Kiplinger Research Library of the Historical Society of Washington, D.C., click here: AOI Finding Aid - Collection Index. 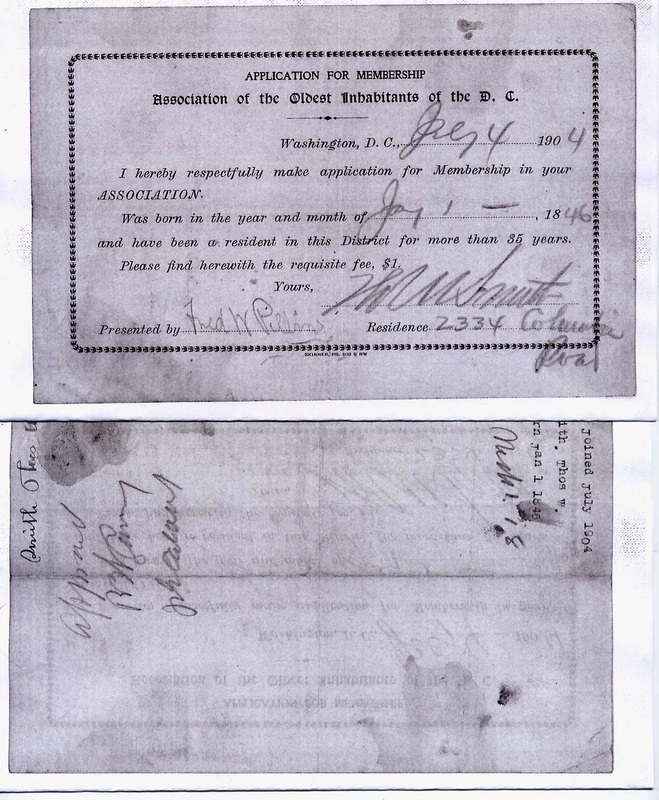 Thomas Wilson Smith's application from 1904. 1928 Membership Application for Alexander Robey Shepherd, Jr.